There are some picture book authors that seem to have a knack for writing books with which people of all ages can identify. 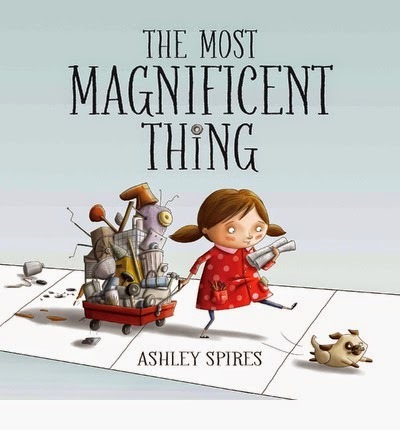 Dr. Seuss, Robert Munsch, and Ashley Spires are all authors loved by kids and adults alike. Spires' book Larf was a great book for capturing how I feel as an adult- as a foreigner in Japan. Small Saul was on a similar vein, with a great message about being true to yourself. Now this book is another that will be perfect on my work desk. An ordinary girl and her canine assistant get to work making the most magnificent thing. But things don't go as planned and she starts to get frustrated. "Her hands feel too BIG to work, and her brain is too full of all the not-right things." I feel like that at work all the time. She and her assistant have a great message for the reader about perseverance and taking a breather when it all becomes too much. But this isn't just for adults. My kids loved this little girl and her wise, furry sidekick. Her expressions are adorable and all the things she makes are cool. Maybe this will inspire other people to make their own magnificent things. I hope it means Spires is inspired to make more magnificent books. Sounds like another one for my (ever growing, thanks largely to you) wish list!